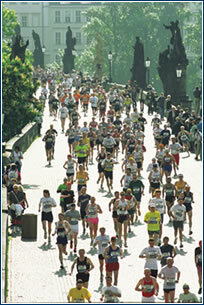 For many people, the marathon symbolizes outdoing oneself. It’s easy to sign up, but finishing the 42 km is considerably harder. Here is our advice for preparing to achieve your personal best. How to begin? 1. Examination by a sports medicine doctor – Get a stress test and follow the doctor’s advice. 2. Thorough and regular preparation – For at least several months before the race, run regularly (3 to 6 times a week, at least an hour). 3. Running pace – Begin at a comfortable pace, then gradually speed up. 4. Good shoes – Shoes must guide and support your feet, prevent ankle turns, stabilize movement, and dampen jolting. Socks are also important – the best are made of materials that cushion your feet and carry away perspiration. 5. Training diet – Eat your last light meal rich in saccharides no later than 2.5 to 3 hours before running. Drink about a half liter of liquids in the two hours before training. 6. Clothing – Don’t wear overly warm garb, as you will heat up. Wear functional underwear (which best carries away perspiration), and garments containing cotton as a second layer. 7. Consult with coaches – PIM has running clubs with experienced coaches. They will all welcome you to their clubs and advise you. 1. Insufficient warmup – Before longer runs you must warm up sufficiently. Stretch your muscles, do a few exercises, or start out with a very slow trot. 2. Irregular training – Stick to your training plan. 3. Stitches – There can be two causes: either you start running too quickly or you ate too much shortly before running. 4. Poor condition tuning – Don’t burn yourself out training. You have to tune your condition so it reaches its peak on race day. 1. Don’t train two to three days before the race, just jog a little (no more than 5 km). Sleep a lot, relax, and avoid stress. It’s better to avoid milk products one day before a race. 2. While racing consume liquids – even slight dehydration will decrease performance and heighten the risk of cramping. It’s good to drink at the first refreshment stops, even if you don’t feel thirsty. It’s also good to eat a small amount of banana or orange, as fructose is good energy source. 3. Follow post-run procedure. Drink a lot after the finish, and when you get hungry, eat something easy to digest with lots of saccharides. Although the temptation is great, don’t just collapse onto the grass – it’s better to trot it off. Among other things, this helps speed up the breakdown of lactates that cause muscle pain in the days following the marathon. solicitor and managing partner, SeddonsWhy did you decide to run the marathon? What did you do to prepare? managing director, LandmarkWhy did you decide to run the marathon? What did you do to prepare?